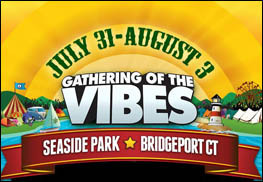 BRIDGEPORT, CT (CelebrityAccess) — The final lineup for the 2014 Gathering of the Vibes festival has been announced, with Dispatch, Karl Denson's Tiny Universe, Allen Stone, Banooba and Artist At Large Stanley Jones added to the bill. Previously announced artists on this year's lineup include returning favorites such Dark Star Orchestra, Strangefolk, Dumpstaphunk, Umphrey’s McGee, moe., Ryan Montbleau, Deep Banana Blackout, Kung Fu, and beloved Master of Ceremonies Wavy Gravy. Bands confirmed for their first Vibes experience include Widespread Panic, Rodrigo y Gabriela, Joe Russo’s Almost Dead, Edward Sharpe & the Magnetic Zeros, Slightly Stoopid, Langhorne Slim & The Law, Donna the Buffalo, Leftover Salmon, and White Denim. Also at the festival this year Keller Williams, Jeff Austin of Yonder Mountain String Band, and Reed Mathis of Tea Leaf Green will team up as “Grateful Grass,” while Grateful Dead percussionists and world music favorite Rhythm Devils, Mickey Hart & Bill Kreutzmann of the Grateful Dead, join forces with The Disco Biscuits for a sepcial set.